Carvedilol Phosphate is the phosphate salt form of carvedilol, a racemic mixture and adrenergic blocking agent with antihypertensive activity and devoid of intrinsic sympathomimetic activity. Carvedilol is a nonselective beta blocker/alpha-1 blocker and used in management of congestive heart failure (CHF). Nebivolol is a β1 receptor blocker with nitric oxide-potentiating vasodilatory effect used in treatment of hypertension and also for left ventricular failure. Moxisylyte hydrochloride is an alpha-adrenergic blocking agent used for the treatment of Raynaud's disease. Fargesin is a neolignan isolated from Magnolia plants. It is a potential β1AR antagonist through cAMP/PKA pathway. Boldine, isolated from Peumus boldus, has alpha-adrenergic antagonist activities in vascular tissue with anti-oxidant, hepatoprotective, cytoprotective, antipyretic and anti-inflammatory effects. Landiolol hydrochloride is the hydrochloride salt form of Landiolol, which is an ultra-short-acting β1 selective adrenoceptor antagonist. Metoprolol Succinate is the succinate salt form of metoprolol, a cardioselective competitive beta-1 adrenergic receptor antagonist with antihypertensive properties and devoid of intrinsic sympathomimetic activity. Metoprolol is a cardioselective β1-adrenergic blocking agent with log Kd values of −7.26±0.07, −6.89±0.09, −5.16±0.12 for β1, β2, and β3 adrenoceptors, respectively. It is used for acute myocardial infarction, heart failure, angina pectoris and mild to moderate hypertension. Dapiprazole Hydrochloride is the hydrochloride salt form of dapiprazole, an alpha-adrenergic blocker used to reverse mydriasis after eye examination. Dibenamine is an irreversible blocker of α1 adrenoceptors. Rauwolscine hydrochloride is the hydrochloride salt form of Rauwolscine, a specific and potent α2 antagonist with Ki of 12 nM. PC-3 and LNCaP cell viability following treatment with a1-adrenoceptor antagonists. (A) Cells were treated with drug (0.01-100 μM) for 72 hr and cell viability determined using the resazurin reduction assay. (B) Effect of treatment duration on PC-3 and LNCap cell survival following treatment with doxazosin (30 μM) or prazosin (30 μM). Survival is expressed as the percentage values of untreated vehicle control and values are the mean ( sem) of six independent determinations each conducted in triplicate. *P<0.05, ***P<0.001 compared to corresponding values for LNCap cells. Piribedil is a relatively selective dopamine (D2/D3) agonist with moderate antidepressant activity. It also has α2-adrenergic (α2A/α2C) antagonist properties. (B) Bar graphs summarize the incidence of VA from Con (An external file that holds a picture, illustration, etc. Object name is srep07681-m1.jpg) and HF (An external file that holds a picture, illustration, etc. Object name is srep07681-m2.jpg) guinea pigs before and after administration of Sal (10 μM) or Sal plus ICI (1 μM) (*p < 0.05, HF + Sal vs. Con + Sal; #p < 0.05, HF + Sal vs. HF + Sal + ICI, n = 6). Isoproterenol Sulfate is the sulfate salt form of isoproterenol, a beta-adrenergic receptor agonist with bronchodilator activity. 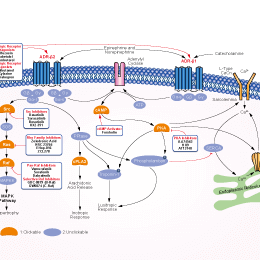 Norepinephrine is the neurotransmitter at most sympathetic neuroeffector junctions and has pharmacologic effects on both α1 and β1 adrenoceptors. Dihydroergotamine Mesylate is an ergot derivative with agonistic activity for alpha-adrenergic, serotonergic, and dopaminergic receptors. Brimonidine is an alpha adrenergic receptor agonist (primarily alpha-2) and is used for the treatment of open-angle glaucoma or ocular hypertension to lower intraocular pressure. Xylazine is a partial alpha-2 adrenergic agonist that is used for sedation, anesthesia, muscle relaxation, and analgesia in animals such as horses, cattle and other non-human mammals. Tetryzoline is an alpha-adrenergic agonist used in some over-the-counter eye drops and nasal sprays. Midodrine hydrochloride is the hydrochloride salt form of midodrine, an adrenergic alpha-1 agonist used as a vasopressor. Midodrine belongs to the class of medications known as vasopressors. It is an adrenergic alpha-1 agonist. Arformoterol Tartrate is the tartrate salt of arformoterol, a long-acting beta-2 adrenergic agonist with bronchodilator activity. Indacaterol is an ultra-long-acting β-adrenoceptor agonist with pKi of 7.36 for β1-adrenoceptor and pKi of 5.48 for β2-adrenoceptor. Nylidrin Hydrochloride, a β-adrenergic agonist, is used therapeutically for its vasodilating effect on the peripheral circulation and possibly on the cerebral circulation as well. Salbutamol is a short-acting, selective beta2-adrenergic receptor agonist used to treat or prevent bronchospasm in patients with asthma, bronchitis, emphysema, and other lung diseases. Salmeterol is a long-acting beta2-adrenergic receptor agonist with Ki value of 1.5 nM for WT β2AR and shows very high selectivity for the WT β2AR(β1Ki/β2Ki ratio of approximately 1500). (F) Fluo-4 AM-loaded EPLC-SMCs and HCASMCs displayed a change in cell surface area following phenylephrine stimulation. Scale bars, 100 μm. (G) Percentage change in cell surface area. Error bars represent SEM; n = 12 cells; **p < 0.01 versus D15 + 8 + 6 cells that did not exhibit calcium transients, analyzed by the Student's t-test. HCASMCs, human coronary artery smooth muscle cells; NS, no significant difference. Higenamine, also known as Norcoclaurine HCl, is a non-selective β2 adrenoceptor agonist which is a chemical compound naturally occurring in a number of plants. Methoxyphenamine Hydrochloride is a β-adrenergic receptor agonist of the amphetamine class used as a bronchodilator. Vilanterol trifenatate is a novel inhaled long-acting beta2 adrenoceptor agonist with inherent 24-hour activity for once daily treatment of COPD and asthma.